Around this time last year we reflected upon how the life changes we’ve made since 2008 were motivated by more than just a desire to fulfill a dream of bicycling around the world together (although that was a pretty big motivator for us!). Simplifying our lives and ridding ourselves of unnecessary “stuff” would allow us the time and energy to devote to causes and issues we felt were important. So how are we doing on that front?. 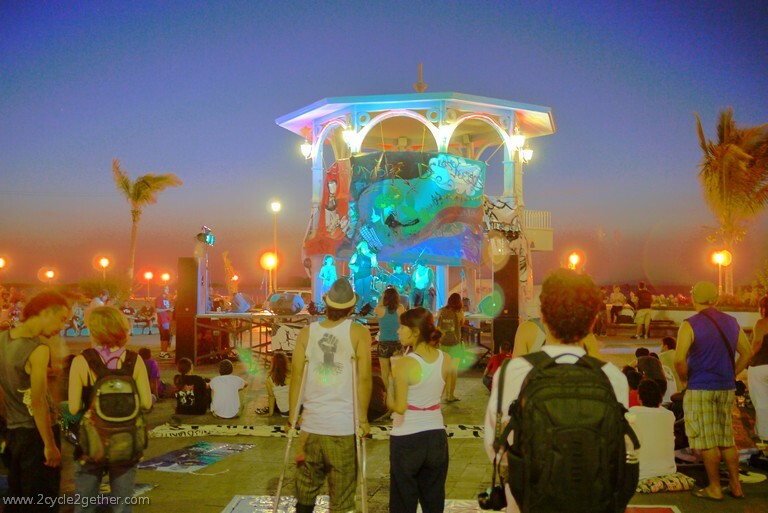 We attended The People’s Summit (Cumbre de los Pueblos) in La Paz last summer to help protest the G20 Summit. Our video coverage of the event was distributed and published by the ‘Mexican Coalition against the G20’. The People’s Summit (Cumbre de los Pueblos) in La Paz. We honored our 350.org pledge, and had several other cyclists around the world join us, to dedicate 350 KM of our ride toward connecting the dots between climate change and humankind’s future. We Marched Against Monsanto with millions of others around the world on May 25th, 2013. Bicycling to the March Against Monsanto in Ajijic, Jalisco Mexico. We founded “Vermonters Against Toxic Sludge“, a community group opposing the land application or export of toxic sludge. The group actively works to promote safe & sustainable alternatives to our current reliance on unhealthy and prohibitively expensive sewage & septic systems. We focus on alternatives like the Ecological Sanitation model and other models that don’t rely on water, electricity and an extensive infrastructure. We’re also involved with many other campaigns that oppose various social or environmental injustices, like the Keystone XL pipeline, expansion of Canadian-owned mines in the sacred lands of indigenous people, and the F-35s being based in Vermont, and we’re always writing a letter to the editor, to our representatives, or to organizations that need to hear from the citizens that keep them in business. I’m very excited to have become a volunteer for Wiser.org, the social network for sustainability. Although I don’t have much time to devote to projects until we finish our book, Laura, the volunteer coordinator, has been kind enough to work around my limited availability. In honor of International Women’s Day I volunteered to redesign and update a website for a women’s health clinic in Ajijic. I’m also designing new pamphlets for the non-profit organization to use in school presentations on health and family planning, which will replace material that was last updated in 1997. I’ll share the website and more information once I complete this project. The women’s health clinic in Ajijic, Centro de Desarrollo Jocotopec. Although we like rolling our sleeves up and giving of our time and energy when we’re able, we also believe in sharing a portion of our income with neighbors and community organizations that are doing good work. We don’t have much to give but, in our opinion, every little bit helps. The list below includes some of those we’ve donated to over the past year. In an effort to spread the philanthropic spirit, we share information about organizations we give to on our Fundraising Page. If you’re moved to do so, consider sharing your wealth with these organizations as well. Kiva Loans – Make a $25 loan FOR FREE through our 2cycle2gether Kiva team today. By doing so, Kiva will also give us a bonus $25 to loan. This is a win-win people! Project Unbreakable :: The mission of Project Unbreakable is to increase awareness of the issues surrounding sexual assault and encourage the act of healing through art. Founder Grace Brown works with survivors of sexual assault, photographing them holding a poster with a quote from their attacker. Secret Survivors :: Secret Survivors is an interview-based theater project by NYC-based theater company, Ping Chong & Company, featuring adult survivors of child sexual abuse telling their personal stories on stage. I watched a live streaming of the production and, as a survivor of childhood sexual abuse, it was one of the most powerful things I’ve ever witnessed. International Labor Rights Forum :: ILRF serves a unique role among human rights organizations as advocates for and with working poor around the world and is committed to ending the problems of child labor, forced labor, and other abusive practices. Rich Earth Institute :: dedicated to advancing and promoting the use of human waste as a resource. Through research, demonstration, and education projects, REI strives to illustrate the positive effect of this approach in important areas including water quality, food security, energy use, soil health, economic sustainability, carbon footprint, public health, and emergency preparedness. DonorsChoose.org :: Public school teachers from every corner of America post classroom project requests and you can give any amount to the project that most inspires you. We gave to Literarcy Power & Help Us Grow as NonFiction Readers. Village Health Works :: whose mission is to provide quality, compassionate health care in a dignified environment, and in collaboration with those they serve, while treating the root causes and the social determinants of illness, disease, violence. League of American Bicyclists :: promoting bicycling for fun, fitness, transportation and work through advocacy and education for a bicycle-friendly America. Re-Cycle :: mission is to collect unwanted bicycles and ship them to Africa. Village Bicycle Project :: supplies bikes, spare parts and tools to villages in Africa. 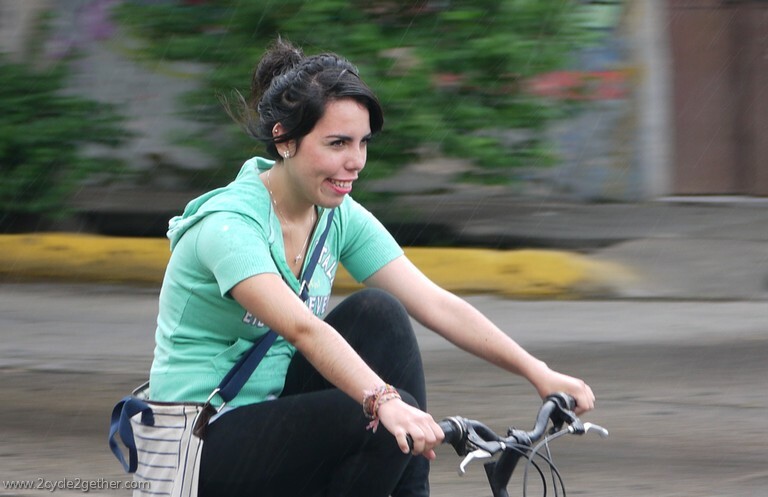 They also train owners in basic bike maintenance and repair, work with bicycle mechanics in their villages to improve their tools and skills, and empower whole communities by including women and girls in bicycle education. Vermont Foodbank :: Gather. Share. Nuture. New England Coalition :: Originally the New England Coalition on Nuclear Pollution, the Coalition was founded by several groups of citizens and scientists concerned about the nation’s growing civilian nuclear power program. VPIRG :: the largest nonprofit consumer and environmental advocacy organization in Vermont. Vermont Digger – Vermont Journalism Trust :: nonprofit organization whose sole mission is to stimulate and commission substantive news content from established journalists. Local Motion – The Big Fix :: to repair the Island Line Trail which was damaged by the Lake Champlain flood of 2011. CCTV Free Speech Fund :: CCTV Center for Media & Democracy expands the reach of organizations by providing the channels, tools and training to get their message across and make social change happen. Lake Champlain International :: To protect, restore, and revitalize Lake Champlain and its communities, LCI educates, advocates, and motivates to ensure that Lake Champlain is swimmable, drinkable, and fishable, understanding that healthy water resources are essential for a healthy economy and a healthy community. NerdGirlHomes :: Kendall is a high school senior fulfilling a dream to build her own house. When she’s done building her Tiny House she’s donating it to someone who is homeless. Janapar: Love on a bike Kickstarter campaign :: To help Tom Allen, fellow touring cyclist, write a memoir about his cycling around the world. A truly engaging and universal message. Check out his book and the documentary. Edible City: Grow the Revolution :: feature-length documentary journey (click to watch the movie) through the local Good Food movement that’s taking root in the San Francisco Bay Area, across the nation and around the world. Also, we gave to support the open source distribution model that the movie’s fiscal sponsor, Bay Area Video Coalition, promotes. Tim DeChristopher Legal Defense Fund :: American climate activist and co-founder of the environmental group Peaceful Uprising. On December 19, 2008 he protested a Bureau of Land Management oil and gas lease auction of 116 parcels of public land in Utah’s redrock country by successfully bidding on 14 parcels of land (totaling 22,500 acres) for $1.8 million with no intention to pay for them. DeChristopher was removed from the auction by federal agents, taken into custody, and questioned. He served 21 months in prison, from July 2011 through April 2013, even though the government ended up ruling the entire auction was originally illegal. “I Stand with Brad”, Bradley Manning Courage to Resist Fund :: The information that Bradley gave to the public has been a catalyst for pro-democracy movements in the Arab world, exposed the unjust detainment of innocent people at Guantanamo Bay, shown us the true human cost of our wars in Iraq and Afghanistan, and changed journalism forever. Suitel 522 Ecological Hostel :: Sichem, forward-thinking owner of Suitel 522, helps to raise guest consciousness about nature and conservation through his on-site environmental programs. Guests are informed about food waste, conservation of resources, recycling and more, and invited to participate, voluntarily, in any of the programs during their stay. 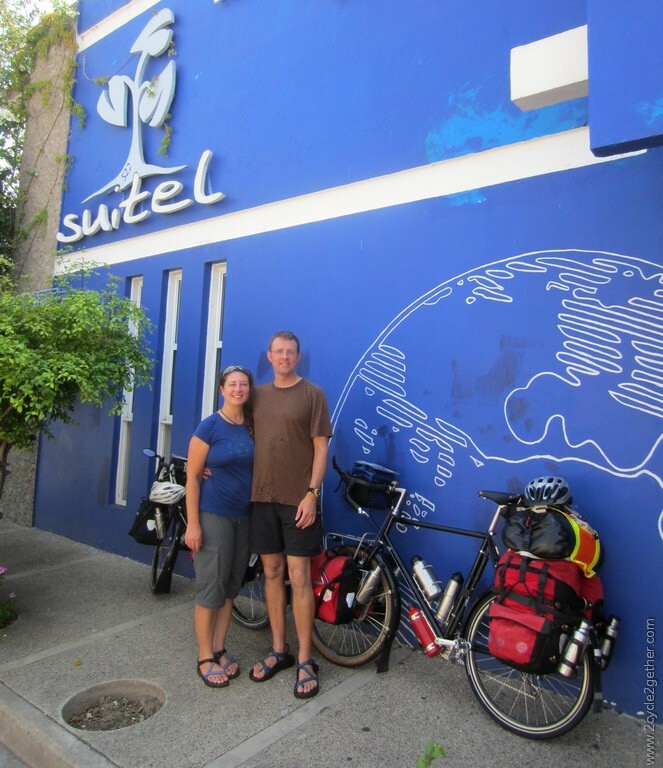 The goal is to give people the ability to take simple steps toward action, which will then, hopefully, spread beyond their stay to their personal homes, then on to others..
Kai & I in front of Suitel 522 Ecological Hostel in Mazatlan. We witnessed Mexico’s presidential electoral process and watched as thousands of Mexican activists took to the streets around the country to protest election fraud. 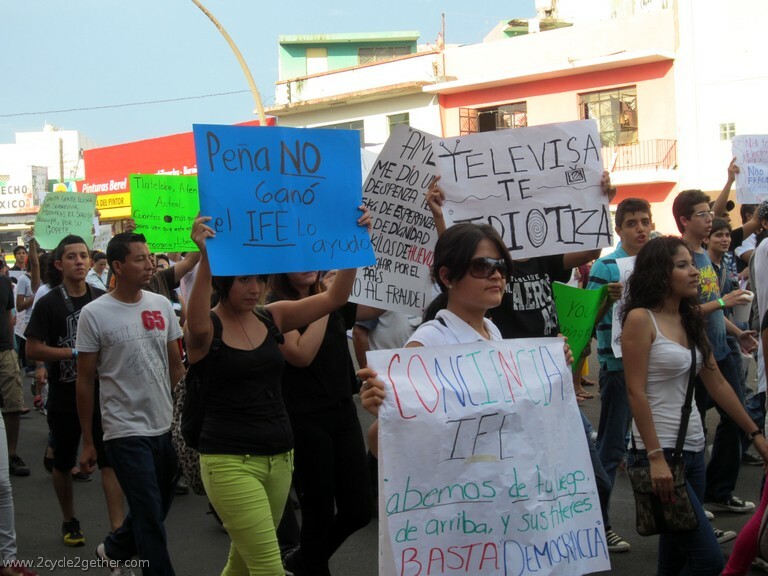 Check out the the video I captured of one protest in Mazatlan. We rode alongside hundreds of thousands of other cyclists in Guadalajara’s Ciclovía, the ViaRecreactiva. Our video ended up making a big impact on people and was distributed around the world by organizations such as TreeHugger, Adventure Cycling Association, Green Savers TV and The Pedal Collective. We plan to share other projects, organizations and inspiring people we’ve come in contact with but haven’t yet blogged about (one thing at a time! ), like a young woman who started a seed-saving network in Jalisco, a group of people who after training with Maya Pedal have started a bike machines cooperative in Mexico, an Ajijic-native artist who has an amazing life story and who creates beautiful work that challenges us to think about life, politics and environmental destruction, and an ecovillage in Tala, Jalisco that sponsored an annual agro-ecological fiesta put together by a network of alternative, environmentally-minded organizations. So, that’s the summary of how we made time for projects and issues that were important to us over the last year. Next up :: Post #3, covering our “Digital Dandies & Creating Community” goal.